Ira Koplowitz and Nick Kosevich of Bittercube Bitters. Photo from Bittercube's Facebook page. Like many, we keep a bottle of bitters in our home bar. We do it because certain drinks call for a dash of bitters — most notably a Manhattan — and yet for the longest time, we never truly understood what purpose they served in cocktail construction. So to find some answers, we had a Q&A session with two bitters buffs, Ira Koplowitz and Nick Kosevich. They are the founders of Bittercube, a Milwaukee company that makes and sells bitters. They also happen to be supremely skilled cocktail crafters and enthusiasts — you might remember Koplowitz from his tumbler shaking days behind the bar at the Violet Hour. We first saw Bittercube products at City Provisions deli in Ravenswood, but traces of the company can be found all over town. 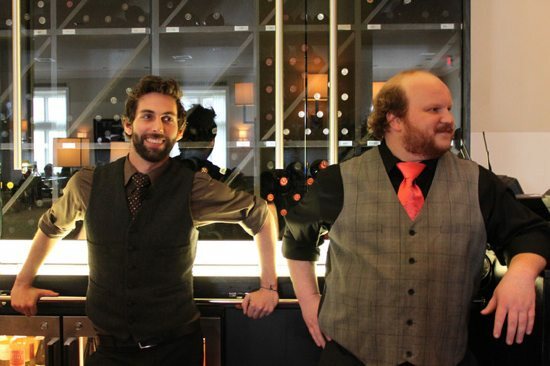 Koplowitz and Kosevich make custom concoctions for bars in Chicago (they created drinks for The Charleston and Chizakaya), teach cocktail classes (most recently at Binny’s), and serve as guest bartenders from time time. Man Up Chicago: Without getting too technical, what are bitters and what are they doing in cocktails? Bittercube: In a sense, bitters are highly concentrated forms of liquid spice. Think of our six varieties of bitters as a spice rack for your bar. We focus on creating our bitters with real ingredients, and utilizing all the parts of a plant: roots, barks, leaves, flowers, fruits and seeds. MUCh: People who make cocktails at home are probably familiar with Angostura bitters. I realize bitters recipes are very secretive, but from a flavor standpoint, what separates your bitters from the ubiquitous Angostura? BC: We make six types of bitters, which is one thing that separates our bitters from Angostura. As far as the process though, Angostura is using vegetable flavoring, extracts and and coloring agents. Bittercube bitters use only natural ingredients, both for flavor as well as color, no natural or artificial flavoring or coloring is added at any stage. Bittercube bitters also use no extracts, which is a common practice for larger bitters companies. We aren’t hating on Angostura, we still use it in cocktail menus we create, but Angostura probably spills more on the production line in a week than we produce in three months! MUCh: You make several different bitters flavors. Are there some good rules of thumb when it comes to matching specific types of liquors with specific flavors of bitters? BC: We believe that you can enhance a cocktail six ways by utilizing each of our bitters. That being said, there are some spirits that work especially well with specific styles of our bitters. Cherry Bark Vanilla and Orange are perfect with bourbon and rye whiskey. Bolivar works well with most spirits as it has a number of spirits at its base, most especially brandy, whiskey and is great with sparkling wine. Both of the Jamaican Bitters are great with rum and hot cocktails. The Blackstrap are interesting with rum, pisco, as well as scotch. MUCh: For the guy that wants to try your bitters, but isn’t ready to invest in the whole collection, which Bittercube bitter do you recommend for beginners? BC: Go with Cherry Bark Vanilla or Bolivar. 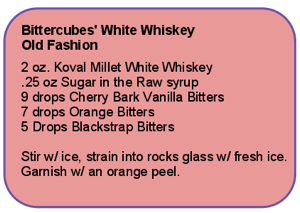 They are both very unique and can be used in a number of ways in highballs, cocktails, Manhattans, Old Fashions, and can also enhance sparkling wine. MUCh: Let’s say a guy has no interest in cocktails, but loves a good micro- (or macro) brew — does he have any use for bitters? BC: Pilsner’s are greatly enhanced with Bittercube Orange Bitters. Pick up a case of PBR and a bottle of Orange Bitters or Jamaican #2 and you won’t be disappointed! Wheat beers are often garnished with an orange slice, but the Orange Bitters are a great replacement if you don’t have an orange at home. The grapefruit notes found in many IPA’s work well with the Jamaican #2 as well. MUCh: Are there any non-alcoholic drinks where bitters would be a good addition? BC: Lemonade, seltzer water, even Coca-Cola can be enhanced with bitters. We’ve been using the bitters with various teas as well. MUCh: Obviously, your goal is to cultivate interest in artisan cocktails and the culture surrounding it. However, do you feel any guilt about contributing to a new breed of pseudo-cocktail experts who annoy people at parties and take ice cubes way too seriously? BC: At the end of the day, its about drinking and its about having fun. We try not to take ourselves too seriously, but we also believe that everyone deserves a good cocktail. For every ice cube evangelical, there is someone else who very much cares about cocktails but isn’t shoving it down your throat! We spend a great deal of time crafting cocktails for large groups. Our goal at Bittercube is to bring cocktails to the masses. There are so many simple yet balanced recipes that can be easily replicated at home. MUCh: Our personal experience with artisan-cocktail bars is that they treat vodka like Voldemort: it is the spirit that shall not be named and not be served. Why is that? Aren’t there any decent craft cocktails that can be made with Vodka? BC: Vodka has definitely gotten a bad rap in the craft cocktail world, but it has its place. The Moscow Mule, of course, is a classic. Some would say that utilizing vodka in cocktails is like painting on saran-wrap, but one thing vodka does is allow for other flavors to shine. Take a simple vodka-seltzer for instance: add 1 dropper of Bittercube Cherry Bark Vanilla Bitters and a half a dropper of Jamaican #2 Biters and you’ve got an interesting drink, and one in which the bitters are the star. We also utilize vodka on a cocktail menu as an introduction into what we do. When people peruse a menu for a cocktail and they’re not a cocktail nerd, they’re looking for familiarity in ingredients. Having vodka based cocktails on a menu can welcome a larger number of people into what you’re focusing on instead of pushing people away who aren’t familiar with genever. MUCh: For the guy who doesn’t want order a drink that looks too colorful and has too many fruit and floral flavors: What artisan cocktail is manly looking, manly sounding, and manly tasting? BC: The Old Fashioned is the quintessential dude cocktail. Not the new version with a muddled cherry and an orange, but the old simple version: Bourbon, a smidgen of Turbinado Syrup, a combination of a few types of bitters, stirred, over fresh ice in a rocks glass with an orange peel. Yum! MUCh: Finally, a long hypothetical: The movie Cocktail is being rebooted for 2012, and you’ve been asked to be the movie’s cocktail consultant. The movie’s premise: The main character is a young man from Oklahoma with a gift for making and creating artisan cocktails. He winds up in the Manhattan speakeasy scene, working at a place like Milk & Honey (I realize that’s sooo 2007, but bear with us). There’s a pivotal scene where the main character’s love interest is introduced. She’s sitting at the bar he works at, and asks him to “surprise” her with a cocktail. The cocktail he makes will lead to her being interested in him and eventually falling in love with him. What cocktail does he make her? BC: He makes her the Aviation. Crisp, refreshing, delicate, and balanced. What more could she possibly want? 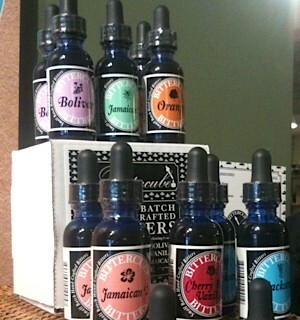 Bittercube bitters come in six varieties. In Chicago, they are available at City Provisions, Binny’s, Lush Fine Spirits, and Warehouse Liquors. You can also order Bittercube’s bitters online. To find out where the Bittercube team might be showing up, teaching classes or guest bartending, follow Bittercube on Twitter or look at the Bittercube Facebook page. Awesome, very insightful piece. Never thought about adding bitters to drinks other than your classic cocktails. I’ve got 4 bottles, now I’m ready to complete the collection! (Peter Griffin Voice) I always thought that bitters, uhhh, came in one flavor. And I learned something today. I am SO interested! I have been curious about bitters for a while now. Where is your Mpls. location? Also, is there a brief booklet on usages and recipes? Thank you, I’d love to hear back. While I don’t know where the bitters are available in Mpls region, you can order them online at http://www.bittercube.com/bitters.html . Also, you can email Nick and Ira at info@bittercube.com. They are very nice guys and will probably let you know where in the Twin Cities Bittercube bitters are available. Bittercube is also on Facebook and Twitter, so you can reach them that way, if that’s your thing. And I’m pretty sure their Facebook page has some recipes that use bitters. I’m also pretty sure Nick and Ira will insist that bitters make just about any cold beverage better. And they would be right to insist that. Thanks for the comment! Feel free to patronize the establishment in the future.